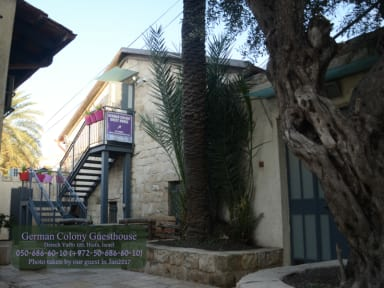 German Colony Guesthouse is situated in a charming German stone house in the picturesque German Colony neighborhood. 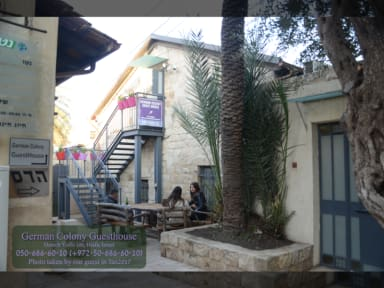 There is Free WiFi and Air Conditioning on all premises. There's a shared kitchen with refrigerator and microwave where you can have free coffee and tea anytime. We will also provide you with a free map if Haifa. Common areas are cleaned daily. We offer you budget private rooms with private and shared bathrooms and Cable TV in every room. You also have Free WiFi, Air Conditioning and Heating in your room. Linen & towels are provided. We have a weekly room service. Cancellation policy: Costumers will not be charged if they cancel their reservation 24 hours or more before arrival. Payment upon arrival by cash (USD/NIS only), credit cards, paypal. Children under 18 years of age are not allowed unless accompanied by an adult.